I had never heard of Albondigas until about three weeks ago. We were watching Food Network’s All-Star Academy and one of Bobby’s contestants made Albondigas for the first challenge. I went straight to google to learn more about these Albondigas and was very happy to learn it was meatball soup. 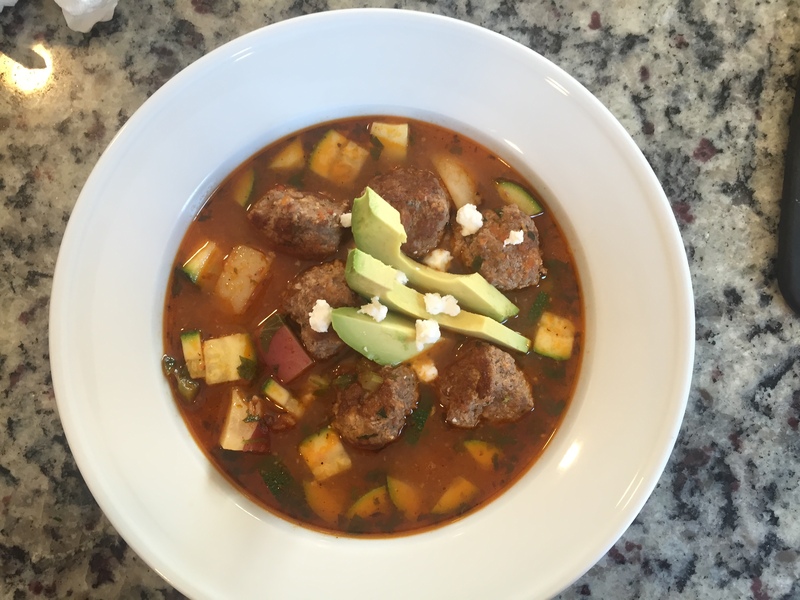 The Walters love their meatballs, and Italian Wedding Soup is a staple in our house. We also love Mexican flavors so I was pretty pumped to make these. I also was very intrigued that the meatballs use cooked white rice as a binder rather than breadcrumbs or cheese. I have used coconut flour as a sub for breadcrumbs in my Italian Wedding Soup meatballs so I thought I may try some almond flour in my Albondigas to keep it Whole30. 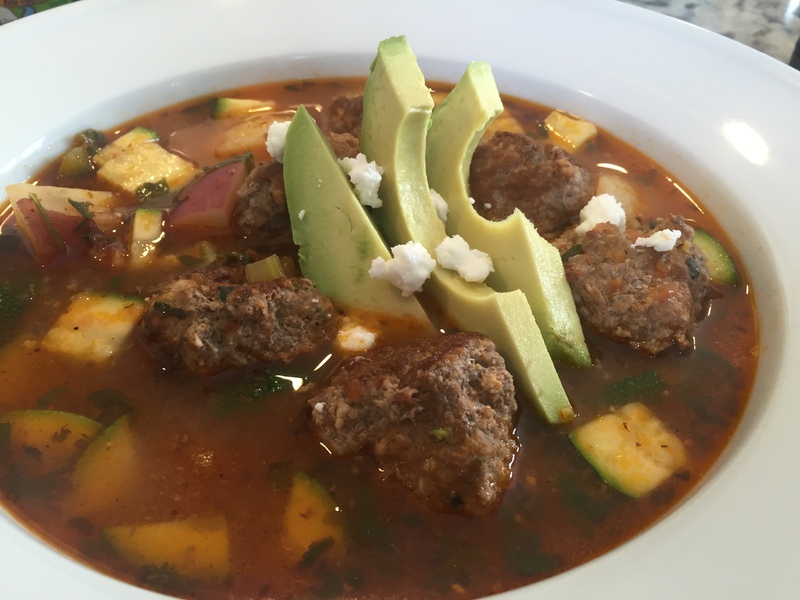 I did my research and found several really interesting recipes for Albondigas. As I often do, I took the aspects that appealed most to me and combined them into my own little concoction, with Whole30/Paleo compliance as my goal. The result was to.die.for. Seriously. This was surprisingly good. I was a bit nervous about the mint, but it truly does make the dish. One of the recipes I read said “its not Albondigas without mint” and I believe that to be true. This comforting soup has a zesty zing that will make you so happy you have leftovers for next day’s lunch. This is a shade on the spicy side. You can dial that back by using green bell peppers rather than poblano peppers. 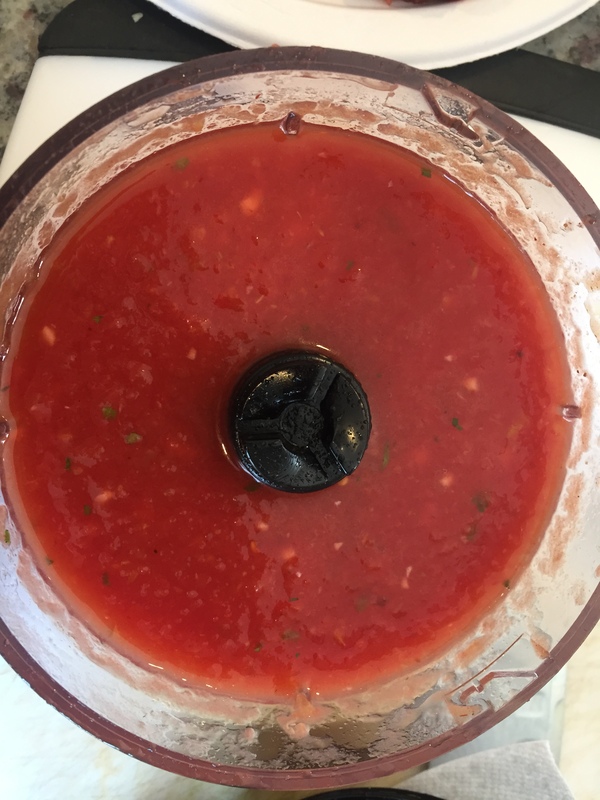 You can also reduce the chipotle abodo sauce to 1 tsp, but I really advise not doing that with the abodo sauce until you have tried it as written. I think you will miss some of the zesty zing without it. If you make this, let me know what you think or what you would change! I love feedback! I am a big fan of mise en place so recommend you start by prepping all ingredients. Get your gear in order, slice and dice your veggies, measure your spices, etc. Gear I use: Immersion blender with bowl attachment, small ice cream scoop. 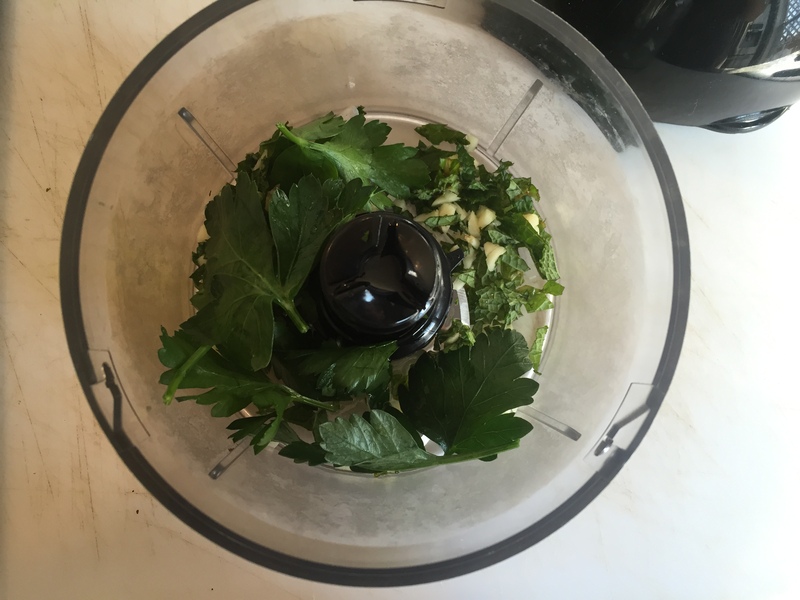 Take the mint leaves, garlic and olive oil and put into the bowl attachment of an immersion blender and chop. 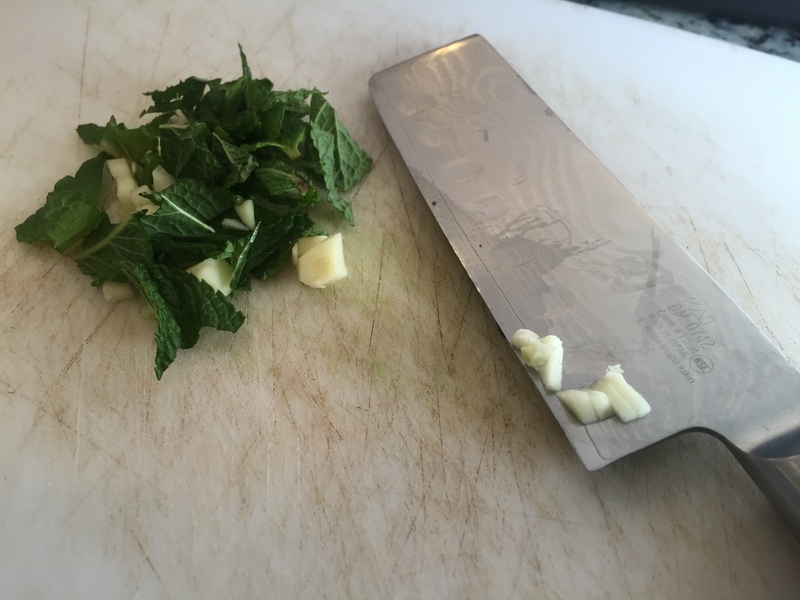 If you don’t have this or similar gear, you can just chop both garlic and mint together add a tiny bit (not 1 tsp) of the olive oil to get it as grainy/pasty consistency as possible. Add these ingredients to a medium size bowl. along with the meat, eggs and almond flour* and mix well, be careful not to over mix or your meatballs could turn out a bit dense. 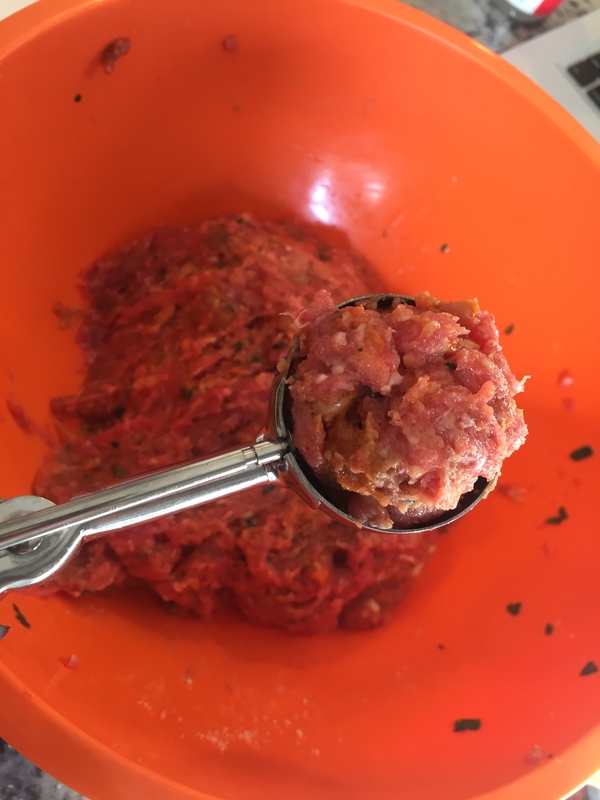 Once meatball ingredients are well incorporated, use a mini ice cream scoop to form them into shape. When I make meatballs I typically just make them all at once and transfer one at a time to a paper plate for easy clean up. Gear I use: Le Crueset dutch oven, immersion blender with bowl attachment. Heat oil of choice in dutch oven or large heavy bottomed pot over medium heat. (I used 1 TBS Ghee as referenced in the ingredients.) Add carrots, celery and poblano and sauté until soft, approx. 5 minutes. While veg is sautéing, add canned tomatoes, garlic, mint, parsley and the abode sauce to the bowl attachment of an immersion blender and crush it. If no immersion blender, use a food processor or blender. Be sure that you only use the sauce, not the peppers or seeds from the chipotles in abodo, or your soup will be extremely spicy. Then add all that goodness into the pot with the veggies. Give it a good stir, add the potatoes, and let simmer about 3-4 minutes. Add all the chicken broth and turn the heat up just a bit to bring the soup just barely to boiling. Add cilantro, oregano, chili powder, salt and pepper and stir, stir, stir! Now turn your attention back to your meatballs. Heat a cast iron skillet or whichever skillet you use to sear, over medium low heat. Met about a TBS of your choice of fat (I used the bacon fat referenced in the ingredients. When the pan is hot, add the meatballs in batches and brown. Your goal is only to brown the meatballs at this point. They will finish cooking in the soup. My meatballs are usually 75-85% browned around the outside, its good to have some spots not browned as this helps develop more flavors while the meatballs cook in the broth. As the meatballs are browned, add them directly to your low boiling pot. Add the can of water, lower heat and simmer for 15 minutes. All ingredients EXCEPT the zucchini should now be in the pot. Add the zucchini in the last 5 minutes of cook time. Serve with sliced or diced avocado and a squeeze of fresh lime juice (do not skip the lime!!!) If you are not doing strict Whole30/Paleo add some cojita or feta cheese, just a little sprinkle goes a long way! Click here to learn why and how I Whole30!